Administrators set Default Project Options globally. These control how all projects and their tasks function. All projects use these default settings at project creation. Project managers, project schedulers or PMO managers are allowed to change these Project Options. While the project is displayed, hover on the Views menu option and selection Options. The Project Options form displays, with the Default Options tab automatically showing. For more information on the other tabs in this section see Cross Project Dependencies, Project Baseline, Project/Task Health Indicators and Custom Work Schedules. Projects can be configured to function in different ways depending on requirements for managing the project. Project Options and Project & Task Rate Settings apply to the project. These aren't defaults. These are the actual project level settings. For Task Options though, these defaults that are set and are automatically applied to all tasks, but they can then be changed at an individual task level as required. In a lot of organizations, all projects may be managed in exactly the same way. The system administrator will set up default options once in the Administration section and then those settings will be applied automatically to every project and task created. Project managers, schedulers, or PMO managers won't need to change anything. In other circumstances, projects or tasks may be managed differently. In those cases, the project will still be created with the default settings from the administration, but then project managers, schedulers, or PMO managers will change them as required on an individual project by project basis. 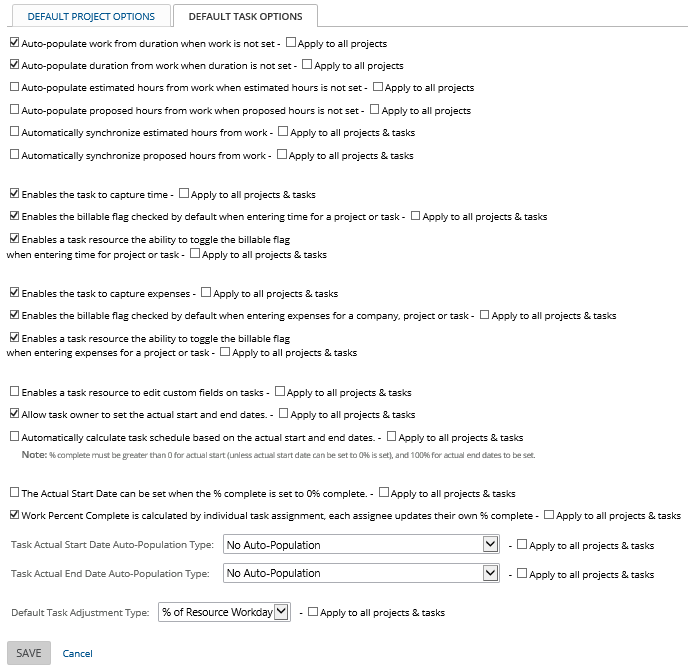 For more information on setting the project and task default options in the administration section, see Default Project Options. In situations where projects are created from templates, then the default project and task options are inherited from the settings in the template. The default settings from the administration are not used. Again, project managers, schedulers or PMO managers can change the settings on that project as required. These options apply to the project overall. Using the 'Use the resource's personal work calendar when adding resources to the project' will set this option as the default selection for each new resource added to the project. Using the personal work calendar forces the project schedule to adjust tasks in accordance with the personal schedule for the resource, even if the resource's work schedule has conflicts with this project. For example, a resource may have a schedule that defines a work day as four hours, while the project schedule may be defined with work days of eight hours. A resource assigned to a one day duration task in the project would automatically adjust to a two day duration in order to accommodate the fact that the resource's day is valued at only one-half the duration of the project schedule day. Similarly, the project tasks will increase task durations to accommodate any non-work time (vacation days) that are included in the resource's personal work schedule when the resource is assigned to a task that is scheduled within the time frame of the resource's non-work time. If you normally want Issues within projects to limit the assignment of the issue to only those resources assigned to the project, you can check this box to enforce that restriction. If you normally want To-Dos within projects to limit the assignment of the issue to only those resources assigned to the project, you can check this box to enforce that restriction. This section turn on/off functions that are applicable to all tasks and sets defaults for lead and lag (which can then be changed when setting up dependencies). You can apply rates to tasks based on the Resource Type/Role for a particular skill set as defined in a Contract. I.e. Project Management work will be billed at the Contracts hourly rate for a Project Manager regardless of the specific Project Manager assigned to the task. 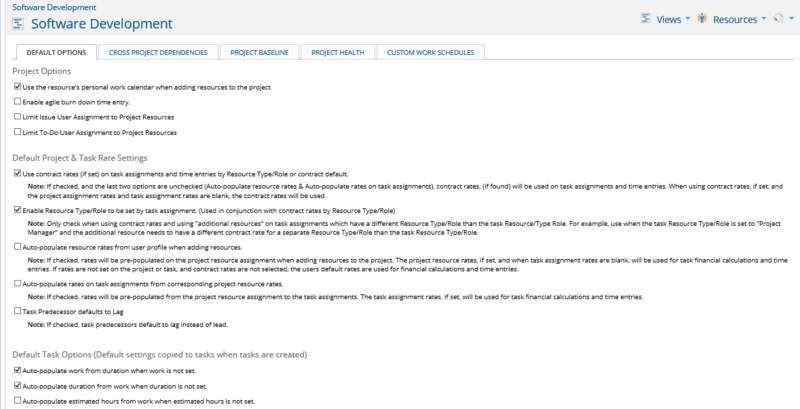 While it is normally recommended that only one resource type/role is assigned to a task, this option allows for multiple resources with different Resource Type assignments to have varying rates. This option should not be used without a complete understanding of work rates, and only if work rate variances for multiple resources within a single task are required. This sets all task predecessors to default to lag instead of lead. This is a default only. When a predecessor is added, lead or lag can be set as required. This section set defaults for how each individual task functions. These settings only apply to new tasks that are created. They do not retrospectively apply to already created tasks unless, you check the option to "Apply to all tasks". If that option is checked, once the settings are saved, all tasks will be updated automatically to have these settings. Use caution when doing this, because any individual task settings will be over-written with these ones. 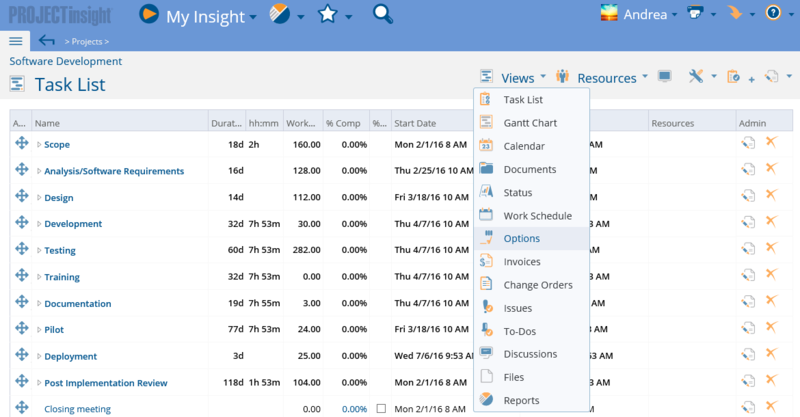 Enables the Work Percent Complete to be calculated by individual task assignment and allows each resource to update % complete. Click to save your settings and update any existing tasks (if you clicked Apply to all Tasks).